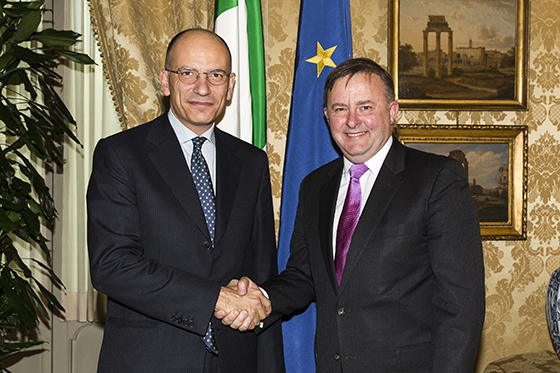 It was an honour last week to meet with the Prime Minister of Italy, Enrico Letta, in Rome where he confirmed he will visit Australia in 2014 for the G20 and Bilateral program. At the meeting we discussed furthering the economic relationship between our countries and the need to update the Australia – Italy air services agreement. Prime Minister Letta will be the first Italian Prime Minister to visit Australia. More than 900,000 Australians have Italian heritage, and Australia and Italy enjoy a warm and long-standing relationship, underpinned by links between our people and our businesses. As the Shadow Minister for Infrastructure, I invited a significant delegation from the peak Italian infrastructure organization, Confindustria, to Australia to help increase the presence of Italian infrastructure companies in Australia, including Ghella. In trade terms, Italy is our fifth-largest export market in the European Union and our third-largest source of EU imports after Germany and the United Kingdom. It has been my privilege to build the sister city relationship between Leichhardt and Giovinazzo, which is a wonderful example of the connection between Australia and Italy. This visit can only strengthen ties between the two countries and I look forward to Prime Minister Letta’s visit to Australia in 2014. When in Government, Labor also delivered $3.6 million to build the Italian Cultural Centre in Norton Street Leichhardt, the heartland of the Italian community in Australia.